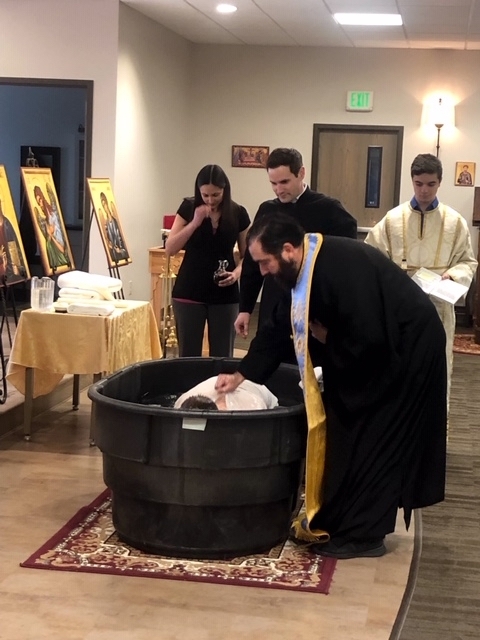 Parishioners and friends gathered together following the Divine Liturgy on Forgiveness Sunday to welcome into the Holy Orthodox Faith, through the mystery of Holy Baptism, the newly illumined Max Walker. We congratulate Max, his family, and his sponsors in the faith, Nicholas and Alexis Bellack. May his path always be blessed and may he be a pious and humble defender of the faith following in the example of his patron, Saint Maximus the Confessor! Champion of Orthodoxy, teacher of purity and of true worship, / enlightener of the universe and adornment of hierarchs: / all-wise father Maximus, your teachings have gleamed with light upon all things. / Intercede before Christ God to save our souls.